Home » Memory Foam Or Pocket Sprung – Which Is Best? When it comes to buying a mattress, the initial choice between foam and innerspring is one of the biggest. There is a lot of difference between the two, in terms of feel, support and durability, and finding out which is better suited for you is key to a great night’s sleep. 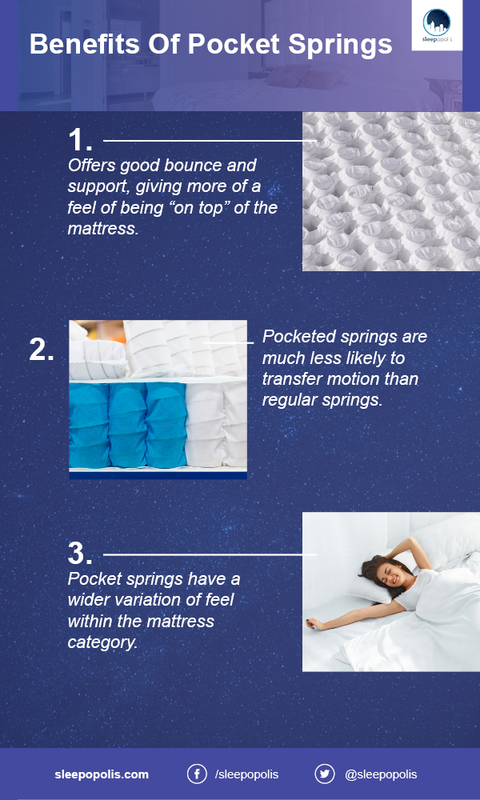 Here we compare two of the most popular mattress choices: memory foam vs. pocket sprung. Memory foam is a viscoelastic, man-made foam. 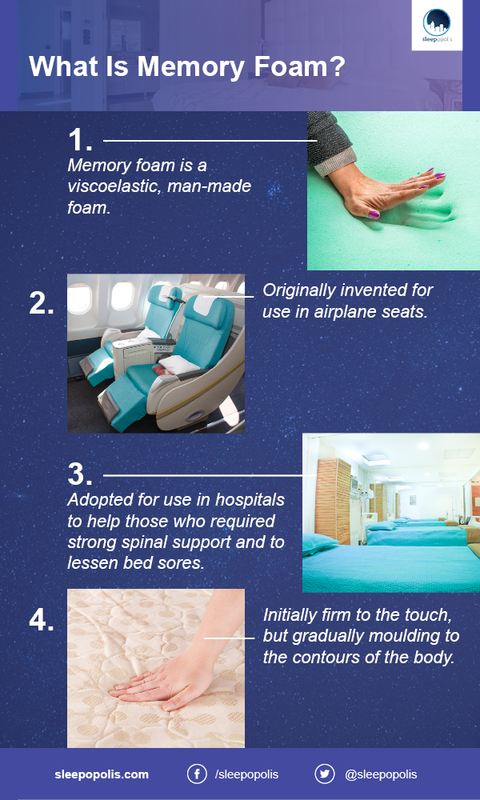 It was originally invented for use in airplane seats, before being adopted for use in hospitals to help those who required strong spinal support and to lessen bed sores. Memory foam then made its way to the consumer market in the form of mattresses and pillows. It has a very distinct feel – initially firm to the touch, but gradually moulding to the contours of the body. 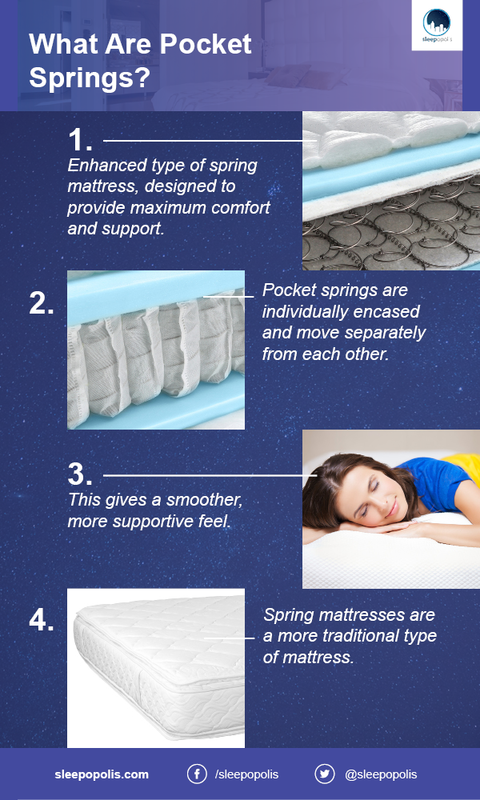 A pocket sprung mattress is an enhanced type of spring mattress, designed to provide maximum comfort and support. Instead of all the springs being intertwined, pocket springs are individually encased and move separately from each other. This gives a smoother, more supportive feel. Innerspring mattresses are a more traditional type of mattress, and thought of as the predecessor to modern foam mattresses – however, this does not necessarily mean they are any less good. Memory foam is heat sensitive and can help keep a bed warm in a cooler climate. Memory foam mattresses are generally thought to be longer lasting than any type of spring mattress. This is because they are designed to return to their original shape time after time. Over time, pocket springs can wear down – although this can be mitigated by turning over your mattress regularly. Memory foam mattresses tend to be lighter than their spring counterparts, making transportation and movement easier. 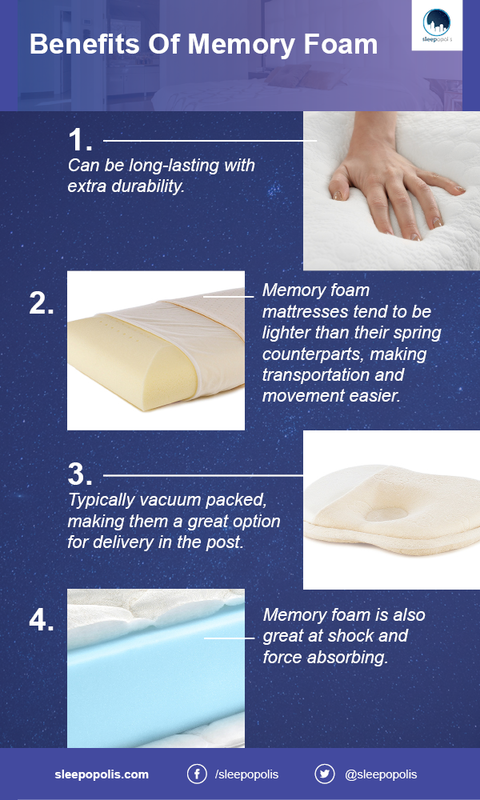 Memory foam mattresses are typically vacuum packed, making them a great option for delivery in the post. For those who suffer from joint pain or back problems, a memory foam mattress can be a good choice. It offers the correct amount of support and you’re unlikely to wake up in pain. Memory foam mattresses are also hypoallergenic and don’t collect dust, making them a better choice for those with allergies. Memory foam is also better at shock absorbing. If you share a bed with a restless sleeper or fidgeter, a memory foam mattress can ensure you won’t get woken up every time they move. For those living in warmer climates or who typically “run hot,” memory foam could be a poor choice due to its potential for heat retention. Often memory foam mattresses now come with a “cooling” gel layer to help alleviate this issue. Another issue some people have with memory foam is one of personal preference. Memory foam has a particular feel to it, which some people find unpleasant. They have a lot of sinkage, and a lack of bounce, and some people report feeling “trapped” in the mattress. Memory foam mattresses are also more difficult to move around in, so if you like to change position a lot while you sleep, it may not be the best choice for you. A new memory foam mattress has a particular, chemical smell. While this does fade over time, it can be initially unpleasant to some users. A pocket sprung mattress offers more bounce and support, giving more of a feel of being “on top” of the mattress. Although innerspring mattresses have somewhat of a reputation for being uneven and poking you, pocketed springs are much less likely to do this. This is because each spring is individually encased and moves independently, giving a smoother, supported feel – some call it a “hugging” feeling. It also mitigates the issue of motion transfer typical of an innerspring mattress. Because the coils are individual, rather than one unit, moving on one part of the mattress is less likely to make another part of the mattress also move. Pocket springs have a wider variation of feel within the mattress category. This is because the amount of individual springs can vary, and that determines the firmness of the mattress. The higher the number, the firmer the mattress will be. You’ll generally want to go for those with 1000 springs or more, though, as anything lower may be indicative of lower quality. A common critique of a pocket sprung mattress is the way they respond to pressure. Spring mattresses respond to the pressure of the body by pushing back against the body with a similar amount of pressure. However, he body does not apply to same amount of pressure evenly across the mattress. Thus, the areas of the body which press down the hardest of the bed (typically the chest, hips and head) will get more pressure pushback. Some people find this uncomfortable, and it can be problematic for those with back or joint issues. Memory Foam vs. Pocket Sprung: Which Is Best? Heat. If you tend to be too hot during the night, memory foam may exacerbate this issue. Movement. If you like to move a lot during the night, a pocket sprung mattress will better allow for this. Bed Sharing. For those who share a bed, memory foam can be better at absorbing movement, leading to less disturbances. Durability. If the lasting power of a mattress is important to you, memory foam is usually thought of as more durable. Support. If you suffer with spine or joint issues, memory foam is better suited to your needs. Feel. This comes down personal preference. If you like something firm and less bouncy, go for memory foam. If you prefer something springier, go for, well, springs. If you are interested in purchasing a spring or foam mattress and are curious which is the best option for you, the Sleepopolis guide is available here. Very helpful, thanks. Better informed as I make my mattress choice!